Reigning Amateur champion Jovan Rebula, along with the country’s top ranked Wilco Nienaber and Matt Saulez, are primed for their Eisenhower Trophy challenge at the World Amateur Team Championship in Ireland. 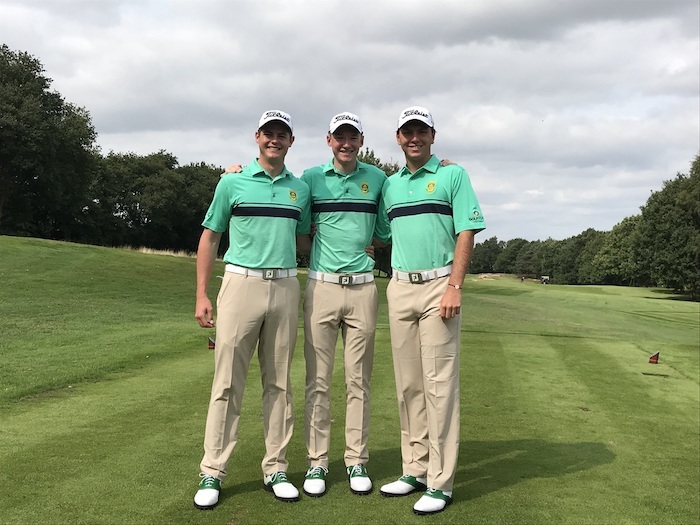 Rebula, the country’s highest ranked player in the World Amateur Golf Ranking, joined his fellow GolfRSA National Squad players near the end of August in the United Kingdom to prepare for the biennial event at Carton House. He declared the team ready to chase down South Africa’s first success in the 72-hole amateur championship split over the Montgomerie and O’Meara Courses from 5-8 September. ‘We have trained hard in preparation for the Eisenhower Trophy and we are ready to fire,’ said Rebula. ‘High expectations is part and parcel of this week, but we will take things a shot at a time and enjoy the experience. Things may not go our way all the time and the key to success will be to re-focus and to fight harder. The South African trio will contend against 70 teams eager for glory in amateur golf’s showpiece but Rebula, Nienaber and Saulez know what it takes to perform at the highest level. Following his Amateur Championship success during the GolfRSA National Squad Tour to Great Britain and Ireland in June and July, Rebula rubbed shoulders with the cream of professional golf at The Open at Carnoustie. The 21-year-old George golfer also qualified for the U.S. Amateur, but missed out on the match play stage by just one shot at Pebble Beach. In his first season at Auburn University, Rebula posted the eighth-lowest average in single-season program history. Seven top-20 finishes earned him Second Team All-Sec honours and he turning in 10 cards in the 60s in 19 rounds. Nienaber rose to prominence with 11 victories in 2017, including three titles on the Global Junior Golf circuit in South Africa, Germany and the United States. The 18-year-old rose to number one in the Open Amateur Rankings following his first victory of the season in the Free State Open. He cemented his position with a third place finish in the SA Stroke Play and the double in the Western Province Amateur. Just a fortnight after he lost the Brabazon Trophy in a play-off in July, the Free State junior became the first South African to win the stroke play qualifier at The Amateur. Saulez has held the number two ranking in South Africa following a runner-up finish in the SA Stroke Play. The KwaZulu-Natal golfer also enjoyed an impressive run abroad with cuts made in the Lytham Trophy, Irish Amateur, the St Links Trophy, The Amateur, The Trans Mississippi Amateur and Southern Amateur Championships. The team turned up at Carton House on Saturday to support the women’s team, who tied for 15th in Espirito Santo Trophy, and spent Sunday doing some work and exploring Carton House.